Exactly ten years ago today, the world financial system received a shock whose impact is still affecting the course of history. This was, of course, the demise of Lehman Brothers. (For an excellent history and analysis of the effects of the financial crisis, see this recent article in the New Yorker (September 17,2018.) I was not particularly surprised, though the roller coaster of those days affected me much as it did most people. But I had been anticipating disaster. 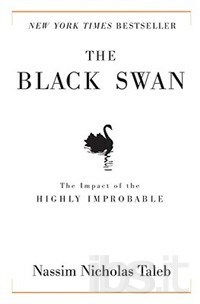 I read The Black Swan when it was first published in 2007. This is a complicated and difficult read, but its basic message is that simplistic predictions are likely to fail. Events can follow a chaotic path, which doesn’t mean jumbled, but obeying a mathematical course explained in the science of complexity (chaos theory). Taleb explains this at great confusing length, but he has one memorable metaphor (paraphrased below). He suggests that we (were) due for a surprise. If one uses past behavior to predict the future, consider the turkey. All is going well. He is protected from predators, fed well, given shelter and room to run. Day after day brings nothing but good news. Then comes Thanksgiving. 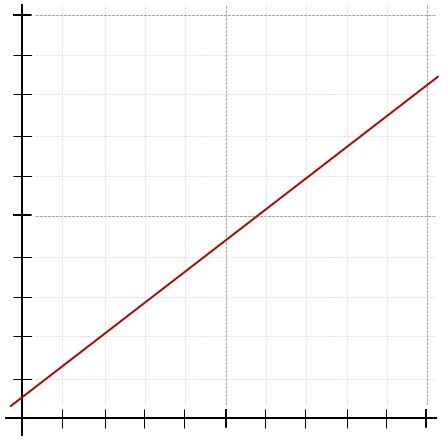 Straight-line growth. It just keeps going! Meanwhile, there were other troublesome economic indicators. The price of oil had been rising steadily over the decade, reaching a price of over $160 per barrel in June, 2008. As I confessed later, I had been a subscriber to dystopian thinking (including the peak oil concept) for some time. My response was to focus on concepts of sustainability (the classic concept, not the self-serving development concept). I expanded my vegetable garden, began promoting the local food concept (see my Ann Arbor Observer article, Meet the Locavores), and began a blog, Voltaire’s Garden. This is a reference to the French philosopher Voltaire’s often-quoted recommendation to “cultivate our garden” as a response to hardship and cruelty in the world abroad. This post, May You Live in Interesting Times, explains that history. Note the emphasis on creating an island of survival and prosperity in the midst of scarcity and disruption. The semester following the financial meltdown, I gained access (through my activities on local food) to an informal seminar series that was being conducted by some graduate students at the School of Natural Resources and Environment (SNRE) at the University of Michigan. I don’t recall the title, if it had one, but there were many speakers, both invited and student participants, on subjects ranging from how to fight food deserts in Detroit, to the futurist Nicole Foss, and others discussing everything from the coming energy crisis to how local farms might be established. (The pioneering farmer Richard Andres was a strong influence.) It was a heady time, with the sense of a beginning revolution. To me, the outstanding moment was a lecture by UM professor Thomas Princen on the subject of localization. Dr. Princen’s field of specialization is economic and ecological sustainability and he has written several books. Here is my review of one of them, The Logic of Sufficiency. It posits many of the same concepts of classic sustainability (with an equilibrium rather than growth) that I find so attractive. Localization is a process of social change brought on by unavoidable declines in available energy, as well by diminishing natural resource and waste sink capacities. Attention, individual and collective, is oriented toward direct relations, social and biophysical. At the time I didn’t understand how controversial this might be. It pushes back against so many of the trends that we have come to accept in an age of globalization. Each locality should solve as many of its own problems as possible and do so in ways suited to its own biophysical and social conditions. (and) Localizers should organize their own local food and water supplies before re-organizing the country or the world. If higher levels of authority are needed to ensure local provisioning, then one organizes at those levels. Otherwise, one looks inward to local capacities, local infrastructure and local needs. This is basically the principle that the resilient communities movement adopts. For a time, the international Transition movement was similarly oriented toward a self-sustaining community. Here is my account of a local Transition organizing meeting (April 2009, in the same time frame as the discussion I have been relating). And here is the recommendation that I truly took to heart. Place-based Decisionmaking Principle: When critical life-support systems are at risk, key decisions should reside with those who demonstrate a connection and commitment to place, not with those who are placeless. This “residential” principle says that people who live and work in a community are more likely to represent community values, be dependent on the coherence and durability of the community in place, and know that place. In today’s environment with the emphasis on equity and accommodation, this is likely to raise eyebrows, if not blood pressures. And yet it is based on a “lifeboat” view of how a community may survive when the world is unfriendly. In its own way it echoes Voltaire’s island against the world. If we once again experience food shortages and lack of sufficient resources to carry on a minimal standard of life, it may seem to be the only course. Princen went on to teach a course in Localization for several semesters, using a textbook that a colleague, Raymond de Young (also an instructor in the course), and he wrote, The Localization Reader. Most chapters are by other authors, and some, like the essays by Wendell Berry, are classics. Some have accused the Neighborhoods of being elitists and implied that they are worse. But actually, the shoe is on the other foot. The whole thrust and focus is to wealth creation at the expense of long-time residents, many of whom are not particularly well off. Who owns the city? Current residents and businesses, or a future populace who are not here yet? Should a small group of elected and appointed officials make all the decisions and determine the course of the city? Or should the citizenry be empowered to help set the course? As I indicated in that post, the problem is that Ann Arbor has become so attractive a place to live that property can essentially be mined for “gold”. Wealth creation is a powerful drive. Conditions have changed since 2009. Oil prices have gone down (but are going up again) and there have been a number of adaptations (renewable energy taking the place of fossil fuels even in commercial generation; a robust local food economy) that make our current state less perilous. But the rapid advance of climate change and global warming make worldwide, if not local, economic and resource availability uncertain. We have an unpredictable chief executive in the White House and there are many changes occurring and more likely in the Federal structure that we have come to depend on. There are skirmishes, humanitarian disasters, and migration surges everywhere. Water shortages and infrastructure failures are an increasing concern. I don’t think that cultivation of our garden (or our resilient local community) is yet uncalled for. Still, I think that I have said enough in the support of localization (which was, after all, the purpose of Local In Ann Arbor). I have a couple more things to get off my mind, and then I will be closing this blog and moving on to another project. I’m grateful for the readership I have enjoyed over the last decade. UPDATE: Today (September 17, 2018) the Local in Ann Arbor scene took a couple of blows. Mary Morgan, the former publisher of the Ann Arbor Chronicle (an invaluable local news site) and founder of the CivCity Initiative (a nonprofit devoted to encouraging citizens to be involved in local government), has announced that she will be relocating and the nonprofit will be terminated. Both of these highly estimable projects failed to attract sufficient monetary support from the public to make them feasible over the long term. She will be missed. Bouquets, Mary, and I hope there is a good donut shop where you are going. Steve Bean, who has been part of our local scene for many years (read about his run for Mayor) also mentioned as an aside on Facebook that he is relocating to parts unknown. Here’s hoping he finds a suitable person to take over his permaculture garden. Ann Arbor will be just a little less interesting. There’s tension or outright hostility between people with different visions of what Ann Arbor should be. Those divisions are becoming fossilized. So now, rather than responding to proposals that should be debated on their merits, people are reacting to the individual who proposed the idea – trying to suss out whether someone is “with us or against us,” and then arguing based on those assumptions. It’s toxic. I don’t know that I wholly agree, but this reflects some of my disillusionment with Ann Arbor politics. It has gotten just plain nasty. One reason I am “leaving town” as well (though staying in place). This Land is – Our Land? The concept of public land goes back so far that it is practically racial memory. The history of many peoples has been the war over open common land vs. privately held lands. Even today there are wars in some locations (e.g., Africa) between herders and farmers. Perhaps the best documented case of a transition from publicly held to privately held land, enclosure, is in England. Enclosure led to wealth for those who held the land, and forced many laborers into cities where they formed the basis of the Industrial Revolution. In this country, the great expanses of land “liberated” from the indigenous peoples who treated them as a common birthright made land ownership available to many common people via the Homestead Act. Property ownership is still one of the best predictors of wealth accumulation and a great majority of people still hope to own their “little bit of heaven”. But despite this drive, we tend to see public land as ours, held in common. In other words, it is our land, to be used for our benefit. Probably the greatest cause of civic strife in Ann Arbor over the years has been the dispute over public land. What is it? First, it is owned by a public entity, whether that is the public schools (but not a charter school), the University of Michigan, or an authority such as the Ann Arbor Transportation Authority. But when owned by the City of Ann Arbor, – that is when many of us feel ownership. It has 10 “permitted uses”. 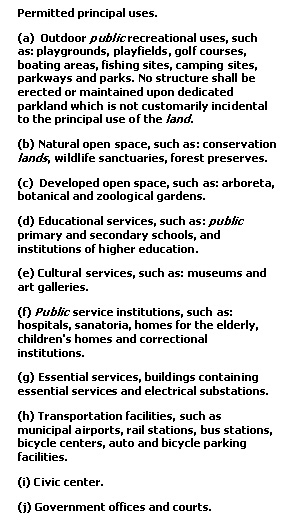 It seems clear that the authors of this classification were thinking about parks right off the top. Note that sentence in the first use about structures that are not incidental to the use of the land? The first three items are about parks and open space. Most of the others are about obvious governmental functions, though item (f) might raise some questions. The PL designation is restrictive and creates a barrier to development. Zoning for two important blocks along William St. Dark red is D1, burnt umber is D2. Two of the most hotly disputed public land holdings in Ann Arbor, the old Y lot and the Library Lot, have never been zoned PL. Note that the Ann Arbor District Library and the Blake Transit Center (and Post Office) are all PL, as is Liberty Plaza. This means that those parcels could not be developed unless they are rezoned, but no such obstacle exists for the two former parking lots. So regardless of zoning, what is the proper use of land owned by a public entity? One hopes that it is for a civic purpose, that is, a purpose that will enhance the condition of the civic body, its residents, its businesses, and its private property owners (taxpayers). And how do we define that civic purpose? That is the job of the policymakers (City Council and certain boards and authorities). We have many policy priorities in the City of Ann Arbor, well recognized and discussed over years. They include environmental objectives such as energy conservation, management of storm water, and conservation of open space; enhancement of business activities (especially in regard to downtown properties), and attention to zoning and planning dictates. Another objective that has become more and more urgent is the provision of affordable housing, both in the sense of subsidized housing for the most vulnerable populations and in so-called “workforce” housing for moderate-income (60%- 100% or sometimes even 120% of median annual wage) people. And for downtown parcels, parking for automobiles is still desired, though often criticized. But wait – there is another objective. Land in Ann Arbor has become so valuable that it is a resource ripe for extraction. One can actually mine money from it, especially if it is in or near downtown. Given the perennial structural deficit that the City often runs, and the ambitions of the Council majority (and now, our very forward-looking City Administrator), it is irresistible to look for a cash return as well. The downtown parcels are actually pots of money just sitting there unrealized. Given the value of downtown parcels, it is a temptation for Council to try to attain all their policy goals and at the same time realize a cash return. This inevitably sets them up for some awkward gymnastics. Developers may wish to develop downtown, but they also insist on making a profit. It is called “Return On Investment”. After all, developing parcels and negotiating with politicians is a lot of work. Another complication is that there has been a fluctuating policy in which sale of city property was designated to be deposited in the City Affordable Housing Trust Fund. The history was well reviewed in the Ann Arbor Chronicle. This policy puts a moral and political pressure on the Council to obtain a cash return on the property. But obtaining cash and also the type of development that they want is truly challenging. The history of RFPs, as used by the Ann Arbor City Council to dispose of public land, is rather sad. The first RFP issued for this purpose in recent history was for affordable housing on the lot recently vacated by the old YMCA (we now know this as the old Y lot). The logic and history behind that RFP were described in an article for the Ann Arbor Observer (the actual published version was edited for length and content but this is the most complete version). We told some of the story here of the William Street Station, the project that won the bid but was killed within a week of being finalized. Another RFP was issued ostensibly to find an appropriate developer for the Library Lot, the former parking lot next to the Ann Arbor District Library. That story is told here and in many posts about the long struggle over the Valiant proposal to develop a hotel and conference center. (See the page Library Lot Conference Center for a list of posts.) Ultimately, the Council terminated the RFP and made no awards. Instead, it directed the DDA to take another look, with the evident intention that there should be a comprehensive downtown planning process. 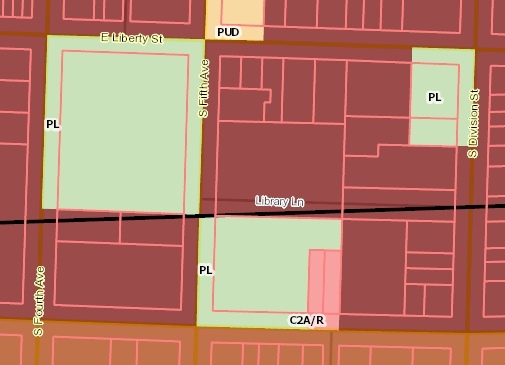 The beginning of this “look” is told here, and the end was the Connecting William Street project, in which the DDA sought to convince us that every surface lot should be built to its highest possible density. That report was never taken up by Council, though the Planning Commission, under the leadership of Kirk Westphal, placed the report on a list of “resources”. With these successes behind it, the Council sought to make things simpler. Both the Y lot and the Library Lot were simply placed with a broker and put up for sale. But neither Council nor the Ann Arbor public could quite shake the notion that public land should be sold only with some public benefits attached to the deal. (We reviewed both the history of the Library Lot and its importance in Ann Arbor’s culture and concept of ourself in our post, Core Space and the Soul of Ann Arbor.) Thus, both of these sales became mired in court cases. But that is a story for later. NOTE: The “Council majority” referred to here is the Taylor caucus (the “Powers That Be“) that has existed for some years, in succession to the Hieftje caucus. A minority of Council members (the “Neighborhoods“) have opposed many of the policy directions and substantive decisions. However, the recent primary has apparently changed those ratios. See The Primary Struggle for the Future of Ann Arbor for details. Meanwhile, the fur is flying as both sides present their case for the ballot issue. As this account by the News explains, a group has formed to fight the ballot issue and persuade Ann Arbor citizens not to vote for the proposal. Unfortunately, some of the assertions by this group border (in my view) on untruths and certainly push the boundaries of polite discourse. Recently Mayor Taylor himself has made an open plea to voters which contains hefty doses of hyperbole. Mary Hathaway, one of the leading lights for the Library Lot park struggle, has responded with a lengthy letter refuting many of Taylor’s points. She admonishes him for the negative tone of his message and asks where the cheery positive person that she remembers has gone. And she addresses directly the financial bind the City Council has made for itself, with both the Y lot and the Library Lot in play, and the evident intent to use proceeds from one sale to pay the expenses of re-acquiring the other. The stakes are indeed high, both monetarily and in terms of credibility of the Mayor, who recently won re-election over a strong opponent (Jack Eaton) but who also lost many of his Council allies. The fate of the ballot issue will tell us much about the future direction of Ann Arbor, since it likely breaks down so neatly along the fault lines that divide us. Unless you have just arrived from Mars, or possibly Denver or Atlanta, you are aware that the City of Ann Arbor has been locked in a mighty political struggle for years. The majority (The Powers That Be, formerly the Council Party) has been pushing an agenda to make Ann Arbor into a high-tech generator of wealth. They have been fighting off insurgent challengers to their authority since approximately 2006. (Some history is in this post.) The rebels are sometimes called “Townies” (see What Does It Mean to Be an Ann Arbor Townie? ) but most often simply the Neighborhoods. This August primary may very well be the telling blow that decides the future direction of our city. This is a war about the very nature and future of Ann Arbor. Will we suffer the same fate as many high-tech communities? Or will we be able to sustain our community, our culture, and our home, all which have made Ann Arbor the very special place it is? And will it continue to be a city where the citizens have real influence over its direction? (1) Ann Arbor will go the way of so many other centers of technological enterprise. We will dedicate our governmental priorities and our infrastructure into making the city attractive (as we believe) to the high-tech workers needed for successful startups. Real estate will become prohibitively expensive as money rushes in to take advantage of the wealth being created. Residents of modest income will be displaced as the cost of living increases. Developers will also take over many of the public spaces and familiar institutions. Much of the casual charm of the city and its sense of community and shared culture will be lost. (2) Ann Arbor will plan to keep housing and local businesses in place by countering some of the actions and decisions that are leading to displacement. This will be done with careful planning and citizen involvement. Ann Arbor will still continue to evolve and will still support enterprise, but will make it possible for a wide spectrum of residents to live and participate in the community. It will be a resilient community where changes in the built environment will be adaptive, not abrupt, where the future is anticipated but the past is respected. We will have a city that is to human scale, that includes restorative green spaces and accessible public areas. There has long been an effort to transform the city from a sleepy college town to a high-tech success story. The aim was economic development. A guy named Rick Snyder helped to start an incubator called the “IT Zone” in downtown Ann Arbor (1999) and also launched SPARK (2005) which then (2007) merged with the IT Zone Meanwhile, Washtenaw County passed a resolution naming Ann Arbor and Ypsilanti downtowns as Smart Zones. These were part of a push by Governor Jennifer Granholm to bring economic revival to Michigan via high technology centers. They allowed school taxes to be captured for economic development in the named centers. (Technically, the taxes are repaid to the local schools by the state, but it is complicated.) Our Local Development Finance Authority administers those funds. Since then, SPARK has infamously received substantial allocations from both Washtenaw County and Ann Arbor City. In the same general time period, Gov. Granholm also launched her Cool Cities initiative, which was presumably modeled after the Richard Florida “Rise of the Creative Class” book and theory. The basic precept is this: to be successful in economic development, cities must install quality of life enhancements that will attract the young “creatives” (who turn out to be mostly tech workers). There was quite a push for this in Ann Arbor around 2010, as I reported. All this met with the agenda of the Powers, who set to the job of transforming Ann Arbor into a different place, one that would support a technology-driven enterprise culture. The word for this type of activity is placemaking and it is now a major field of study and implementation. Much of this is discussed in this post: The Placemaking Agenda and Ann Arbor Politics. The post was written to explain the election of 2014, and most of it remains entirely pertinent today, including the promotion of friendly candidates by the Michigan Talent Agenda. (The MTA is widely known to be run by Ned Staebler, though his name does not appear on the website.) Note the word “talent”. That is the key to entrepreneurial success, as explained in many different pages. The basic concept is to make Ann Arbor a place that appeals to a different class and type of people, especially those who will lend themselves to a technology-driven enterprise culture. It worked! Ann Arbor has attracted a number of technology startups, some of which have even stayed in town. A recent highlight: the sale of homegrown Duo Security for $2.53 Billion to Cisco (reported by MLive). Every day seems to bring a new announcement of a start-up or the growth of one, or other similar successes. We have succeeded in importing “talent” and others. The overall effect of the placemaking efforts has indeed been to bring in more people, which means more need for housing. It must be acknowledged that the University of Michigan plays a part in this, since the student population continues to increase. A local blogger, TreeDownTown, has written a useful overview of the student housing picture, in which he concluded that the massive downtown buildings recently built as student-directed luxury units are barely keeping up with demand. But the overall drive to bring in new “talent” has also meant an influx of affluent new residents who are willing to pay well for housing that satisfies their wish for close-in (to downtown) quality living. For the first time in several decades, Ann Arbor’s population has grown noticeably. According to the United States Census Bureau, Ann Arbor City’s population is estimated to have grown from 113,934 to 121,477 between 2010 and 2017, an increase of 6.6%. That is over 7,500 people looking for housing. Meanwhile, the price of houses is going up and Ann Arbor, according to this 2017 article, is said to be the least affordable housing market in Michigan. One outcome of this drive to transform Ann Arbor has been a strong development push. This has sometimes been led by revisions of downtown zoning (the DDA has been heavily involved in promoting development) but neighborhoods adjacent to downtown have been heavily affected even without changes in zoning. The young population who were the target of all this promotion want to live near downtown, in a nice place, within biking or walking distance. This has put great pressure on the neighborhoods near downtown. It has also driven up the value of downtown property to unimaginable heights. Each time a major development is proposed, it brings out the neighborhood who are fighting to maintain the distinct character of their home territory. For example, Germantown (a neighborhood at the southern edge of downtown, roughly between William, Packard, Madison, and Main) was devastated by the loss of seven historic houses that were the heart of the neighborhood. The Powers opposed a historic district and approved an ugly student-oriented development (City Place) instead. (See Heritage City Place Row.) Other more recent battles have been over 413 E. Huron, unaccountably zoned D1 right next to a residential neighborhood that is also a miracle of historic preservation, now the Foundry Lofts; and the Broadway Lowertown site, which TreeDownTown accurately described as a better deal that could have been had by the City. Battles have also been over the fate of the Library Lot, an Ann Arbor treasure and one of the very few open spaces remaining in the downtown. See Core Spaces and the Soul of Ann Arbor. With the Taylor caucus (the Powers) holding tight, most often with 8 votes but always with a majority, development after development has been approved over the cries of the residents. The face of Ann Arbor is indelibly changed already. These individual battles often obscure the true nature of the war itself. The Neighborhoods, who are not really a party or a coherent group, emerge over and over again as residents fighting for the survival of their community. What is at stake in many cases is displacement, as well as loss of local connections and culture. Displacement has already happened in some areas as gentrification has meant replacement of older structures, often affordable rentals or modest owner-occupied houses, with extremely high-end expensive condominium developments. These are in the desirable near-downtown zone in areas such as Kerrytown, Water Hill, or the Summit Road neighborhood. In classic gentrification style, these were once areas where Black families were grouped because of segregation. Often they had already attracted new owners because they were affordable and had a certain raffish charm. But now the next phase is occurring. For example, Tom Fitzsimmons has built numerous attractive condominiums on former one-house lots or combined lots to create larger developments. New policies appear directed at ensuring such dense development in formerly single-family neighborhoods. As high-priced denser housing sells in each location, the surrounding land becomes more valuable, and simple market pressure causes displacement of renters. One thing everyone agrees with is that housing in Ann Arbor has become unaffordable. But while “affordable housing” is a desirable goal, few agree on what that is and how it should be achieved. To some, affordable housing is targeted to very low income individuals, is subsidized by a variety of governmental programs, and is administered by the Ann Arbor Housing Commission, Avalon Housing, or perhaps other nonprofit or governmental providers. This was the concept presented at a recent Council working session by Jennifer Hall, the Director of the Housing Commission. The AAHC was created to oversee the Federal public housing in Ann Arbor but is becoming the housing and community development department in its reach. (Ann Arbor’s Community Development Department was subsumed by the Urban County in 2008.) Hall and Washtenaw County’s Teresa Gillotti made a very thorough case of the needs for subsidized housing and called for a millage to pay for new housing. Washtenaw County’s 2015 study of Housing Affordability and Economic Equity reviewed the demographic differences (income, educational attainment, etc.) 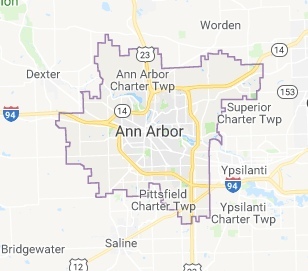 between Ann Arbor and the City of Ypsilanti and concluded that Ann Arbor should add (subsidized) affordable housing while Ypsilanti should add market-rate housing intended to attract Ann Arbor’s highly educated population. The evident intent was to homogenize the population of the two cities. (Pittsfield Township was included in the study but has not been much involved in the conversation.) Jack Eaton was the sole CM to vote against adopting this concept, which he called “social engineering”. He has been beat up about that ever since. But in point of fact, the study made no useful suggestions for creating affordable housing and merely imposed targets on both communities that they are unlikely to meet. The subsidized housing discussed would most often not be accessible to working families making 60-80% of median income (e.g. roughly $44,000 to $57,000). Those would need what is often called “workforce housing”, which must also be subsidized because it is still below market. This means that many service personnel and even public employees like schoolteachers and city staff have difficulty in affording housing here. What must be acknowledged is that everyone who can afford to do so wants to live in Ann Arbor. Thus, the limited land mass in the city has virtually become an extractable resource. Parcels that were previously considered to be virtual wasteland are now being expensively developed. This creates several classes of people who find living here unaffordable. Among them are, yes! two-income professional couples. It is just that expensive. According to Zillow, the median sales price of a house in Ann Arbor is now about $400,000. Unless one is either very high-income or bought in many years ago, buying a house in Ann Arbor is becoming nearly unreachable. A new group supportive of the Powers has been insisting loudly that our current neighborhood residential structure must be altered. These self-named YIMBYs (Yes In My BackYard) seem resentful of current residential homeowners, whom they often term “wealth hoarders” because of unearned appreciation in real estate value. Downzoning Upzoning (which allows denser development in single-family neighborhoods) has been called for. The YIMBYs believe that by building more housing units, regardless of the price, somehow housing will become more affordable and available to them in the desirable areas. Ironically, some appear to be hoping that single-family houses will become available after everyone else moves into the high-priced condos. Much discussion of these options occurs on a Facebook group called Ann Arbor YIMBY. If we are to be inclusive, we must also be open to development that will create homes people can afford. This will be disruptive and will involve trade-offs. If we do not begin to explore and experiment now, we will not meet even our modest affordability goals. The Neighborhoods are not united on all subjects and are not really a coherent group. But generally they wish to retain both their homes and their quality of life. (Yes, lots of complaint about the roads.) Gentrification is a threat. So are increased taxes and increased fees. Recently a water rate restructure has reduced the cost of water service to multifamily developments such as are built by developers, while increasing the cost to certain single-family homes. While the City’s basic tax rate has not increased, allocation of City funds to such multi-million dollar projects as the Treeline ($55 Million) (a greenway conservancy that is already attracting more high-value development along the railroad tracks in what were once the old industrial properties and the lowest value) and the Fuller Road Train Station (ca. $80 million) creates potential tax demands for the future. These are high-risk projects that will encumber current or future City budgets, without bringing direct benefits to current residents. Thus, the Neighborhoods can anticipate either higher taxes, or loss of services, or both, in the drive to bring “talent” for technology to town. Ann Arbor has a strong tradition of citizen involvement, and I believe this is one reason for the strength and vitality of the town. We have a City Charter that requires a number of decisions to be based on a vote of the people, or a supermajority (8 votes) of our elected representatives. We have public comment at meetings and open meetings act/freedom of information act requirements for governmental transparency. With leadership from the former CM Sabra Briere, we have many steps in our development process that make citizen access to planning documents practically global. (I remember when I had to go to the department physically and beg to see them.) There are a number of citizen task forces and committees that produce advisory reports. But some CM have found contributions from the public to be a tedious intervention, sometimes remonstrating from the bench. 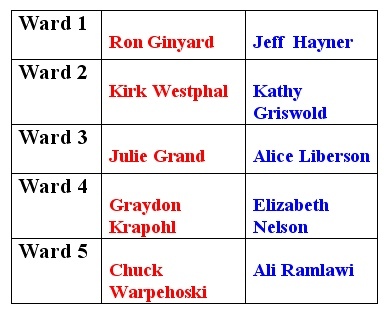 All four Ann Arbor wards which have incumbents running also have a challenger. The First Ward has two candidates running for an open seat; one of them has declared his allegiance to the Powers so is treated here as one of them. The other has affiliated himself with the bloc I am calling the Neighborhoods. Note that each of these candidates has a personal history and individual positions on many issues. None of them are running in a slate. Nevertheless, their places on the chessboard are clear. The race for Mayor is key and the battle is being vigorously fought. The current Mayor, Christopher Taylor, is challenged by current 4th Ward Councilmember Jack Eaton. They are very distinct, not only in their views but in their voting records. Here is a very comprehensive account of their voting records on key issues, as reported by the Ann Arbor News. This is it, folks. Ann Arbor is at a turning point. Please vote. Disclosure: I am Jack Eaton’s campaign treasurer and I have supported the objectives of the Neighborhoods for years. UPDATE: I have been reminded that Council and Mayor terms have now been extended to four years. This election is more meaningful than ever. SECOND UPDATE: This was quite a turnover election. The only “Powers” candidate who survived was Ward 3 Julie Grand, but in addition Mayor Christopher Taylor held an authoritative lead. (Jack Eaton remains as a 4th Ward CM for three years until a new contest.) So Mayor Taylor will now be presiding over a Council where the numbers have turned against him. He’ll have only 4 votes (including his own) against a potential bloc of 7 votes. I predict that the Neighborhoods representatives will not operate in the strict discipline of the old Powers bloc, since they are all individuals with independent viewpoints. But it should not be business as usual. Important note: the new Council will not be seated until the General Election in November. So we have a dangerous period ahead of us where a lame-duck Council may yet take actions. THIRD UPDATE: Obviously, the course of business on Council is likely to shift noticeably beginning in November. Mayor Taylor will not be able to command a supermajority as he has been accustomed to, now that the majority (7) has shifted to the Neighborhoods. (Note that neither “party” has a supermajority.) But we should not expect that drastic changes will occur. For one thing, the Mayor has great influence over the agenda. Also, at least a couple of the newcomers are showing signs of independence. They will assume their place at the table, not just count as a number. We’ve got a lot to do. I mean, other than the 4th Ward, all the races are close. You know, it’s just like national politics, it’s pretty divided. 50 to 50 almost, you know, give or take a couple percentage points, there’s a lot of work to do. The work has just started. We need to be bigger people and better people, reach across the aisle and work with folks who think differently than us. I think we can actually have an honest discussion for the first time in a long time. I think the Mayor and Mayor’s party has had a majority, a supermajority where they didn’t really have to take into consideration what other people thought. For the first time in their career, they have been sobered by the fact that there is a great part of Ann Arbor who doesn’t feel comfortable with their decision-making. and who want a different voice and they elected that. So it feels empowering but at the same time there is a lot of responsibility that comes with that and I need to find ways to bridge the gap and be able to make a difference and move things forward in a way that takes all parts of our community together and don’t just shut out a part of them because they don’t have representation on Council. FOURTH UPDATE: This article from the Wall Street Journal lists Ann Arbor as among the top cities for growth based on the tech culture. Some of the downside is mentioned. GENERAL NOTE: Comments are moderated. I do not allow anonymous comments. I deleted an anonymous commenter who gave an address of “gmail@gmail.com”. Funny, yes? Discussion is welcomed, but you must own up to your comments and avoid abuse. The Ann Arbor City Council majority passed a resolution in July 2017 designating their preferences, which leaned strongly toward using the cash for climate change initiatives. In August, the City Administrator Howard Lazarus issued a memorandum to detail exactly how those funds would be allocated. 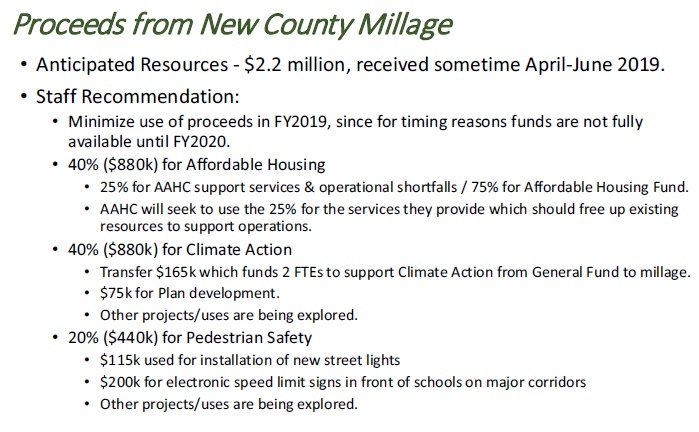 It indicated that proceeds from the millage would be divided so that 20% would go to pedestrian safety, 40% to affordable housing, and 40% for climate change. In the March 12, 2018 budget presentation, these expenditures were further mapped out. 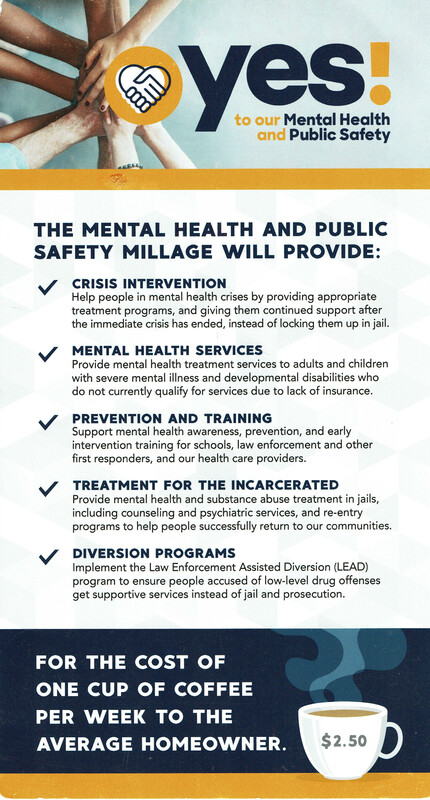 CMHPS members urge the City Council to include the following new actions in its planning and budgeting decisions to remedy this omission.. First, Council members should appropriate 40 percent of current and future revenues from the millage to mental health services. Second, Council members should appoint an advisory group of experts to identify best practices for improved mental health services and related public safety services in time to inform the biennial budget process for fiscal years 2020 and 2021. And to that argument that the public already knew what they were voting for, CMHPS proceeded ahead of time to gather data. They had a professional polling organization conduct a telephone poll. (I received the poll and can report from my own experience that it was not a push poll but seemed to be entirely objectively conducted.) The poll results support their contention that many of the public voting did not understand that part of the millage proceeds would be diverted into other Ann Arbor-specific objectives. When asked what the priority for spending the money would be, 56% answered “mental health services”. When asked whether the information that a different use of the cash would have influenced their vote, 45% said it would have made them less likely to support it. So how did this disconnect occur? The answer doubtless lies with the way local news is not very well transmitted in Ann Arbor now. We have a very intermittent local newspaper, which most people read online, if at all. City Council deliberations and results are followed by a tiny fraction of the electorate. In this case, probably most people got their information from the campaign material sent out by postcard. You’ll note that the website itself only mentions mental health in its title. 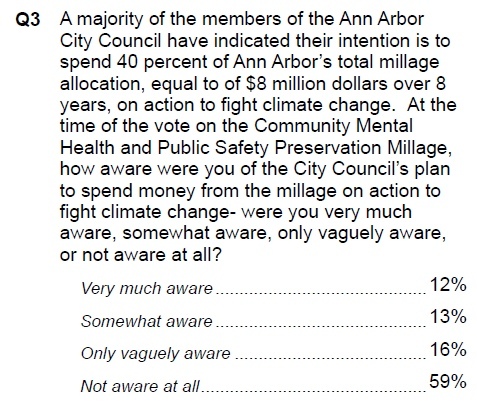 It is obvious why many voters had the impression that this was a mental health millage and why they didn’t understand that millions of dollars would be diverted to climate change and other inside-Ann Arbor-purposes. In an interview, Glenn Nelson, a leader in this effort to redirect Ann Arbor’s “rebate”, stressed that his group still supports the County millage. (And a majority of the taxes collected will go to the purposes stated.) They simply want the money redirected to Ann Arbor used to address mental health and safety issues. Thus they are fine with pedestrian safety and affordable housing (which often is addressed to serving supportive housing in Ann Arbor; this serves mentally needy clients). But they want the focus to return to mental health for the remainder of the proceeds. The Council is in the midst of budget discussions. These generally conclude mid-May. We might suppose that some mention of this issue will come up with this year (FY2019) budget, though Lazarus said not in his memo of last summer. Meanwhile, we have electoral campaigns to conduct. The discussion will continue. 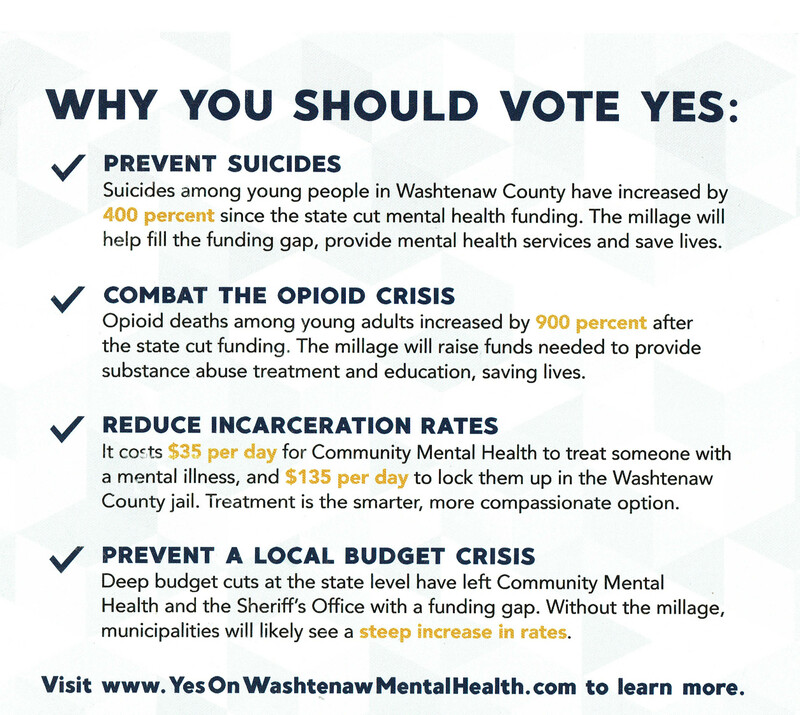 UPDATE: The Ann Arbor Citizens for Mental Health & Public Safety have come out with an election-time plea (June 2018). They ask citizens to take the usage of these funds for mental health into mind in supporting candidates in the August primary. Governance and Transit and Taxes, Oh, My. Breakthrough nears on transit in southeast Michigan. That was the headline in a recent article in Bridge Magazine. It is referring to the Regional Transit Authority of Southeast Michigan. The concept of the RTA is to combine the transit systems of four counties (Oakland, Macomb, Wayne, Washtenaw) into a single authority. It has been just the latest effort to form a truly regional transit system for the metropolitan Detroit region. As this account from Curbed Detroit relates, the effort to achieve regional transit in Motor City has been frustrated over and over again. With the creation of the RTA, it was hoped that it might finally be achieved. A carefully constructed plan (RMTP plan) was put forward in 2016, after many “listening tours” and much negotiation. A millage proposal was placed on the November 2016 ballot. It was not successful. Now there is a last-ditch effort to save the RTA and the possibility of a true regional transit system for Detroit (the only major city without one). But the factors that led to this latest failure, as well as many of the earlier ones, are still here. Note: for all the illustrations of maps, a larger version may be viewed by clicking on the image. Precinct-by-precinct vote for the RTA millage in November 2016. Credit to Steve Wilse (map creator) and the Motor City Freedom Riders. The RTA had gone through many birth pangs (for a blow-by-blow legislative account and other history, see our post, The SE Michigan Regional Transit Authority in Progress) before the package of bills was signed into law by Governor Snyder on December 19, 2012. SEMCOG, the SE Michigan regional planning agency, hosted the fledgling organization, supplying office space, support and a web presence. The RTA Board consists of members appointed by the chief executive of each participating unit of government (in the case of Washtenaw County, which has no county executive, the Chair of the Board of Commissioners). The Governor appoints the Chair, who is ex officio (non-voting). Governor Snyder tapped Paul Hillegonds, a distinguished former state representative who has served in many public capacities as well as in industry. He has led the Board through many travails. The Board had some initial difficulties in settling on a Chief Executive Officer. Then they tapped Michael Ford, the CEO of the newly regional Ann Arbor Area Transportation Authority, who had had a notable success in the May 2014 vote to form the AAATA (as reported by the Ann Arbor Chronicle, over 70% of voters in Ann Arbor and the two Ypsilanti communities voted themselves a 0.7 mill tax to form the expanded authority). With that background, he seemed the ideal person to lead the RTA through a successful regional millage vote. The November 2016 request to taxpayers of Oakland, Wayne, Macomb, and Washtenaw Counties was to commit to a payment of 1.2 mills for 20 years to support the RTA plan. The millage failed, just barely. Since November 2016 the RTA board has been struggling to find a way to achieve success. The obvious approach is to try again with another millage, presumably after a few tweaks here and there. And the obvious moment is November 2018 (the legislation requires a November election date). Today the RTA pretty much gave up and closed up shop. At today’s board meeting, the interim CEO resigned as did their staff planner, leaving 1 administrative staff person and some consultants. The board has no plans at this time to seek a new CEO. SMART has taken over their one project: RefleX. The RTA appears to have abdicated any leadership role, giving everything into the hands of the Big 4 (County Execs and Mayor Duggan) to decide if and when we get transit. The public, riders and other stakeholders appear to have no say. Now a “leadership group” consisting of the elected county executives of three counties plus the Mayor of Detroit has been designated to figure out how to put this deal together. Oh, yes, and also the Chair of the Board of Commissioners for Washtenaw County (Andy LaBarre) was invited to sit in. (He is not mentioned by name and not pictured in this report by the Detroit News.) But really, it is the Big 4 (Detroit Mayor Mike Duggan, Wayne County Executive Warren Evans, Oakland County Executive L. Brooks Patterson and Macomb County Executive Mark Hackel) who hold the fate of the RTA in their hands. Unfortunately, the issues that nearly derailed the RTA before the last millage vote remain. (Governance) alludes to the manner in which government conducts its business and especially the way it interacts with its citizens. Some of the important elements in this interaction are representation, taxation, and power. People generally want to believe that they are fairly represented at the decision-making level. If the body collects taxes, are they proportionate to the function of the governing body? And does this body exert a level of power over daily lives that is appropriate to its function, not dictatorial or burdensome? Governance is at the heart of any effort to create regional entities, especially in Michigan. When you combine a number of essentially sovereign civic bodies (four counties and a major city), questions of representation and power immediately emerge. These are very unlike entities. Oakland County is the most populous and richest. In any relationship that involves taxation, they are likely to contribute the most. Detroit is The City but also has a history of economic problems. Wayne County is the county that contains Detroit. Macomb County is the workingman’s county with a history of being extremely independent on electoral issues (remember the Reagan Democrats?). And Washtenaw is the afterthought, a relatively rural county with a small urban area and some assets like the University of Michigan and the associated technology culture. 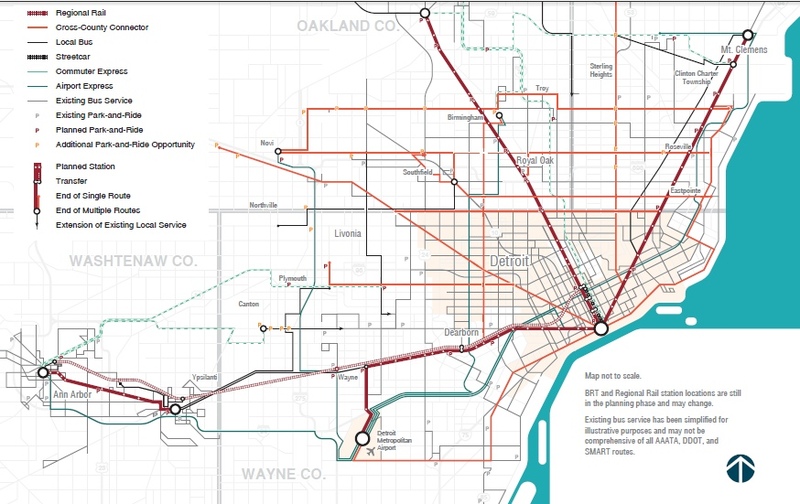 (The original RTA proposal did not include Washtenaw.) All have different things to gain or lose from a regional association. The Citizens’ Research Council, a nonpartisan and well-respected organization that often analyzes governmental issues in Michigan, published a critical examination of regional authorities, with the RTA as its example. It highlighted how uneven the representation is across the authority. From the Citizen’s Research Council. Note the population and representation disparities. Larger percent of population indicates less representation. There was some dispute about representation early on. As finally constituted, the RTA board consisted of two representatives appointed by each county (and one by the City of Detroit), plus a chair (non-voting) appointed by the Governor. I say “each county” but in fact the power of appointment resides with the actual county executives and the Chair of the Board of Commissioners. The question of how many representatives was solved by simply making everyone the same. Except Detroit. Notice that though this is after all a Detroit Metropolitan organization, the City of Detroit receives only one representative, the least well represented of all. The representation is very uneven with regard to taxation as well. Tax paid is determined by the ad-valorem of each county. (We explained some of this in the post, Taxes and the Local Government Quandary.) Because Oakland County has a lot of valuable property, the tax yield both for the entire county and probably for individual taxpayers is quite high. Note also that they have the highest total millage rate of all entities, meaning that their taxpayers are already paying a lot of taxes. An authority shall ensure that not less than 85% of the money raised in each member jurisdiction…is expended on the public transportation service routes located in that member jurisdiction. Of course, this makes it almost impossible to have a truly regional effort. The two Oakland County Board members, Chuck Moss and Timothy Soave, both of whom have solid financial and policy backgrounds, addressed a remarkable memo (Oakland RTA memo) to Ford and Gunter before the November vote. Presumably some of their concerns were addressed, since they later acceded to the ballot issue. But they note, “this 85% rule will require annual monitoring and different expenditure levels yearly as TV’s will always change, thereby causing the sum of the total proceeds to change.” Later in the 19-page memo, they complain that the mechanism to assure that RTA will stay with the 85% rule is vague and they also question the fairness of allocating the remaining 15% outside of the required set-aside. Overall, the concern voiced here is that Oakland County will invest more in the RTA than the services provided will justify. But the authors also question the ability of the RTA to administer the sums coming to them under the requirements placed on them, without harming the present local transit providers and systems. Finally, the plan must establish a binding mechanism to guarantee that the benefits promised to each jurisdiction will be delivered, a mechanism that cannot be overturned by a simple majority vote of the RTA Board. In other words, having two representatives on the board is not enough when one’s interests may be overwhelmed by the majority. That is a power imbalance. The CRC’s analysis concludes that representation by appointment in this fashion violates the “one man, one vote” norm for a body with the power to tax and cause many life rearrangements. It posits that such a board should be elected by the population at large. An example of this form would be the Ann Arbor Public Schools. All voters of the district vote for the entire membership of the school board. But it is not a coincidence that City of Ann Arbor concerns tend to dominate. Most voters of the district live in the City. 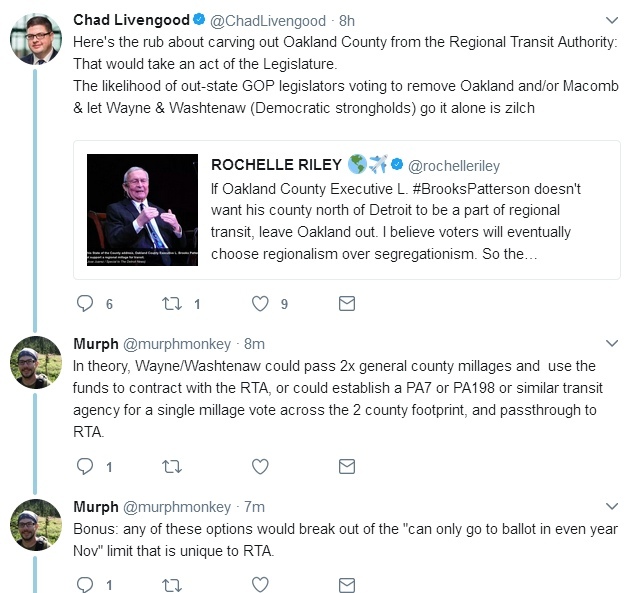 In the case of Oakland County, their higher population numbers would likely give them at least slightly more weight on the RTA than they are being awarded. One obvious take-home from examining the results of the 2016 election is that the parts of the 4-county area that voted against the RTA millage were the areas not currently served by transit. The parts where there were a high percentage of yes votes were the densely settled areas where people are using transit to get to work. Job centers in the RTA area. From the RMTP. Since fixed-route transit (bus routes) are usually installed only where the population density merits it, the transit web itself serves as a population indicator. Existing transit services, from the RTMP. The single line between Washtenaw and Wayne Counties is the Air Ride. In reviewing this, RTA staff suggested to the Board at their spring retreat that perhaps a circumscribed territory for the RTA, addressing only the urbanized areas where there were more yes votes, would be advisable in order to make a new millage more palatable. Proposed limited territory, from RTA Board Retreat (only dark blue areas would be included in RTA). This would, however, have two consequences. One is that an increased millage rate (probably 1.5 mills) would be required. It is assumed that the RMTP, which basically covered those areas, would remain intact. It also means that residents of those areas, many of whom are already paying millages for local services, would be asked to take on a considerable tax load for transit alone. For example, Ann Arbor residents would add 1.5 mills to the current 2.7 mills, and thus a homeowner with a house valued at $200,000 would be paying $420 annually. But considering that most Ann Arbor properties are now valued more highly, the more likely number is $630 (based on a market value of $300,000). The Moss-Soave memo mentioned above makes a particular point about the possible impact on local transit millages, especially if the RTA does not deliver services seen to match its promises. It asks what the RTA will do if local renewable millages fail because of taxpayer fatigue or disillusionment. One reason for urgency is that the RTA has no current source of funds. When the authorizing legislation was passed, it included a $250,000 appropriation, matched by $250,000 from MDOT. In FY 2014-2015, the Legislature added a special appropriation of $1.1M. Since then, they have obtained some planning grants and received some administrative charges for Federal funds. They ended the fiscal year 2017 (September 30, 2017) with less than $1M. They could dip into the government monies distributed to the current providers. Detroit Department of Transportation (DDOT), Suburban Mobility Authority for Regional Transportation (SMART), and Ann Arbor Area Transportation Authority (AAATA) are now subordinate to the RTA for state and Federal funds. Michigan state transportation tax (gas tax) is distributed to public transit providers via the Comprehensive Transportation Fund. There are both operating subsidies and capital funds. Federal funds from the Highway Trust Fund are also distributed to transit providers by a formula. Because the RTA legislation allows 15% of these funds to be used by the RTA, the amounts distributed to local providers could be reduced by that amount. Of course, doing so would likely harm the ability of those agencies to provide actual transit. To my understanding, locally raised millages are exempt from this. But clearly, unless the RTA can raise additional revenue on its own, it would not be helping the cause of public transit to hang on using those funds. 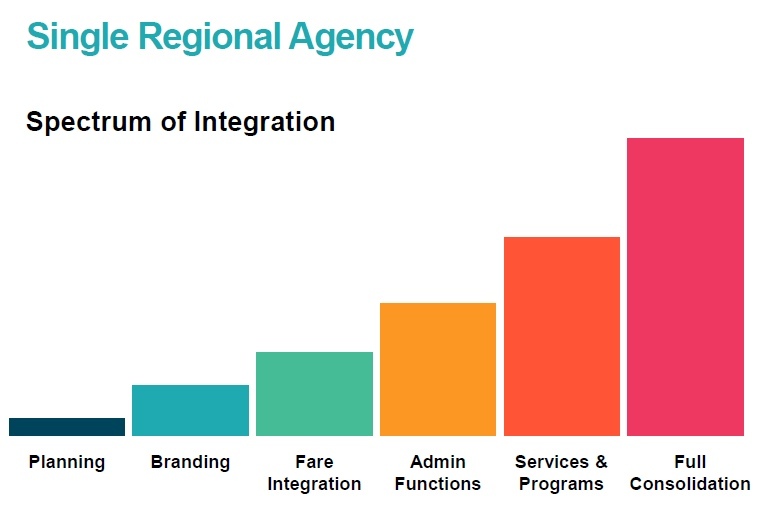 Disconcertingly, one of the options presented to the RTA board in its spring retreat was the idea of consolidation into one agency. On one hand, this is understandable. A long-term complaint and a reason for establishing the RTA was that the suburban SMART system and DDOT have not coordinated well. DDOT is a department of the City of Detroit and is supported by the Detroit General Fund. SMART is supported by millages in various counties and communities (in something of a patchwork). They really were two separate systems and their overlap has been a problem for the greater Detroit community. But on the other hand, different communities have made decisions and commitments in support of these systems, and that is emphatically true of AAATA. Talk about governance issues. Some communities have voted extra taxes for better service. A consolidation does not recognize this. Because this idea was the result of a closely argued process through the Michigan Legislature, any changes would have to pass through transportation committees of both houses and be passed and signed by the Governor in time to write up a new Plan and get the item on the November ballot. It is still possible, but only if everything moves very, very fast. Also, once you open up a piece of legislation, you don’t know what ideas people may have for changing other sections. For example, what if the representation is altered, or the ways funds are distributed? The impetus for the first pass was to provide a venue for the M-1 (now known as the QLine). The Federal funding for that depended on the creation of a regional transit agency. Now the QLine is built and operating. Might the RTA structure be altered to give it better support? (It is not currently part of the plan.) So many possibilities. If the news reports are correct, we’ll be hearing soon what the Big 4 have come up with. The ever-hopeful Megan Owens asks supporters to put in a word. Quotes sometimes appear. But they are not always encouraging. The problem is that the county executives of both Oakland and Macomb Counties are still reluctant though they are evidently willing to sit down at the table. They were both unenthusiastic before the November 2016 vote but wound up taking no position. These two (L. Brooks Patterson of Oakland County and Mark Hackel of Macomb County) are used to being the big power in their own turf, and are very territorial. They might even like to have more power over the way the RTA is run. So while Detroit and Wayne County are anxious to complete a plan, the Big 2 will not be rushed, even by the recent drive to entice Amazon to the area. Hackel in particular has made remarks that indicate he is not supportive of the concept. At one time, he mentioned roads and bridges, and recently he has been bringing up autonomous vehicles and the infrastructure to support them. (Macomb County has a strong involvement in that technology.) He was heard on Michigan Radio as saying he wouldn’t support any plan that didn’t recognize that need. The word on the wind was that we’d hear in January. Here we are. P.S. For those who missed the allusion in the title, Dorothy, the Tin Woodman, and the Scarecrow were tiptoeing through the Wood sharing their fear of Lions and Tigers and Bears (Oh, My). But all they found was the Cowardly Lion. ADDENDUM: Mary Morgan publishes columns irregularly via Medium. The latest one is a transit update. Sadly, she repeats the Bridge article without much more examination. UPDATE: An interview with Paul Hillegonds by the Detroit News includes the suggestion that in the absence of a 2018 millage request, the RTA might look for income to survive until 2020. Hillegonds mentions that one “Plan B” might be to look for the local bus services to support the RTA. That would presumably mean, as we mentioned earlier, that they might tap into the regular operating budget for the local providers. SECOND UPDATE: The Big 4 met on a stage with the Economic Club of Detroit (January 23, 2018) and left the RTA hanging once again. As reported by Crain’s, the execs of Oakland and Macomb Counties are still not committing to any solution. It now sounds as though they might be fishing to put some different features into the plan. Wayne County Executive Warren Evans said a decision was needed in the next 45 days if state legislative action is needed. 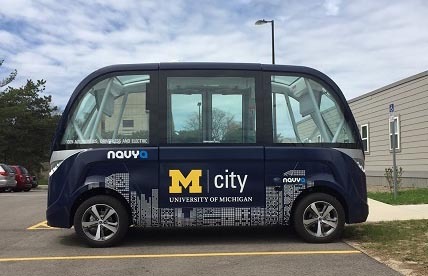 THIRD UPDATE: Regarding automated vehicles, the University of Michigan is a leader in this field, including an automated shuttle already in use on campus. The Federal Transit Administration is issuing an RFC for comments. UM automated shuttle as shown on the FTA site. FOURTH UPDATE: An interview with Paul Hillegonds and Robert Cramer (who runs SMART bus) at the January 29, 2018 TRU Transit Awards event is recorded in this podcast. Hillegonds is cautiously negative about the notion of only Wayne and Washtenaw Counties joining to form an RTA (as was floated in this Bridge article). He seemed to say that if Washtenaw got its commuter rail, there wouldn’t be money for anything else in the truncated RTA. Also, he does not support any option that requires a change in the statute, which would mean action at the State level. Instead, he stated that deputies of the County executives were working on a slightly amended plan that would maintain most of the current version. One possibility is more cross-county routes. The decision needs to be made by April or sooner to allow for work needed to put the item on the ballot. He said that he hopes for a consensus on the Board. FIFTH UPDATE: Oakland County executive Brooks Patterson sounds pretty definite in this February 7 article from the Free Press. Only those communities that currently “opt in” with local property taxes to support SMART bus service should be included in a millage proposal to support regional mass transit, Patterson said. Doesn’t sound like much of a consensus for a new millage proposal. SEVENTH UPDATE: February 14, 2018 – looks as though the Board of Commissioners of Washtenaw County is ready to follow the dream. A BOC special meeting (on February 15) will have a discussion of a resolution in support for a Washtenaw-Wayne RTA. According to a report by the Free Press, the hope of a commuter rail is probably driving this action. EIGHTH UPDATE: The BOC did pass the resolution (with three commissioners absent) on February 15. It instructs the County Administrator to “appropriately engage in discussions about a possible transit agreement between Washtenaw County, Wayne County, the City of Detroit, and other related public entities“. The Administrator is requested to provide a report of options by June. NINTH UPDATE: The Wayne County Executive, Warren Evans, has been pitching a revised four-county plan (March 15, 2018) As noted by Curbed Detroit, it would call for a 1.5 mill tax. But Macomb and Oakland County representatives are still showing notable resistance, according to Crain’s Detroit. ELEVENTH UPDATE: A group of Detroit-area CEOs have come out with a plea to pass a plan, any plan. As discussed in Crain’s Detroit Business, (April 15, 2018) the execs are concerned with the image of Detroit with a poor regional transit system. Evidently the RTA Board is scheduled to meet on April 19 and is being entreated to put something on the ballot. But no particular plan is being endorsed. That doesn’t leave the board with much direction. The rules require that at least one of the appointees from all parties vote in favor of the item. Considering the objections coming from both Macomb and Oakland Counties, that will be a challenge. TWELVETH UPDATE: At the RTA April 19 meeting, it was decided to move ahead with public comment on the Evans plan, now being called Connect Southeast Michigan. The advocacy is currently located on the Detroit Regional Chamber of Commerce site, which may give you a clue to the motivation. According to Crain’s Detroit, the RTA board may vote on whether to move this onto the ballot at their May meeting. THIRTEENTH UPDATE: Not quite relevant to the RTA millage vote, but not very good news, was the failure of the QLine (M-1 streetcar line in Detroit) to achieve its ridership goals for the first year. As reported by Crain’s (May 2, 2018), the line was 500,000 riders below projections for the first year, despite a period of free ridership. The M-1 line was one of the major drivers for the formation of the RTA and received an upfront grant from USDOT upon the RTA legislation’s passage. It is a public-private partnership, with substantial private investment, but it was hoped that the RTA could take over its operation in the future. FOURTEENTH UPDATE: A distracting theme has emerged with action at the State Legislature. According to a Gongwer report published in Crain’s Detroit Business (May 9, 2018), a bill (HB 5870) has been introduced to allow communities to opt out of any new transit millage. It appears to be mostly supported by Oakland County municipalities. This concept has caused the failure of past transit efforts in metro Detroit. Most likely at this point it is more an expression of resistance than a likely change in the state legislation. FIFTEENTH UPDATE: The comments from Macomb and Oakland Counties continue to be negative to the RTA. In a press conference reported by MLive (May 28, 2018), the two County Executives emphasized their support for a renewal of the SMART millage and not for the RTA millage. SIXTEENTH UPDATE: The purchase by Ford Motor Co. of the Michigan Central Station in Detroit’s Corktown has changed some of the tenor of transportation talk, with an emphasis on autonomous vehicles taking some of the energy. As reported in Crain’s Detroit Business, there is talk of making Michigan Avenue a test track for autonomous shuttles. (Ford’s intent is to make the station a headquarters for its autonomous vehicle development.) Meanwhile, the actual use of the station for trains is being dismissed with little more than a nod. But the Wayne-Washtenaw enthusiasts who want a commuter rail are still bringing up the idea. Unfortunately, Wayne County Executive Evans is still hoping for a 4-county RTA. SEVENTEENTH UPDATE: The RTA board finally decided against placing the plan on the November ballot. According to Crains, it didn’t make it out of committee so we don’t know how the Board would have voted. Advocates are vowing to fight another day, maybe next year or the next. Meanwhile, both the SMART and AAATA system millages are up for renewal this year. EIGHTEENTH UPDATE: (August 2018) SMART regional transit millage (parts of Macomb, Oakland and Wayne Counties) passed by a hair in Macomb County but handily in Oakland and Wayne. The AAATA millage passed by a hefty 83% in the urban core region which it serves. NINETEENTH UPDATE: The Citizen’s Research Council has produced a broad-ranging essay about regional transit across Michigan. 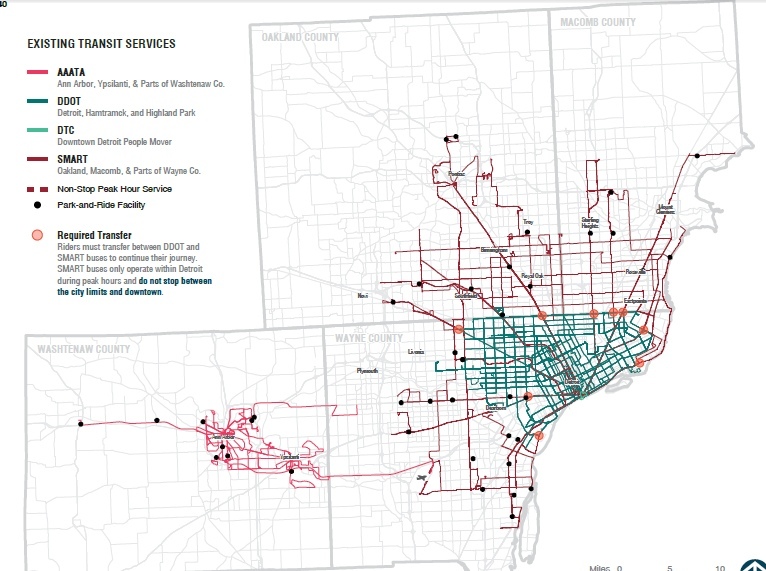 (March 2019: Rethinking Regional Transportation in Michigan’s Urban Areas. ) It points to difficulties in governance and taxation, and suggests what for Michigan are revolutionary ideas, such as new forms of taxation separate from property taxes, and tax-base sharing and/or “feathering”, so that different areas pay different tax rates. Ann Arbor is rushing toward the future. Each day, each moment, events small and large are shaping the new reality. There is no possibility of remaining anchored in the past because we are leaving that behind us. The only question is what shape the future will take and who will frame it. What will emergent Ann Arbor be like and whose vision will best describe it? Much of Ann Arbor’s political polarization in recent years has been from our various efforts to seize the future. One problem with visualizing the future is that none of us has a perfect understanding of the outcome from a specific action. We can surmise, we can expect, we can predict. Often, whether we understand this or not, we are following a model (a set of hypothetical outcomes based on a perceived mechanism). 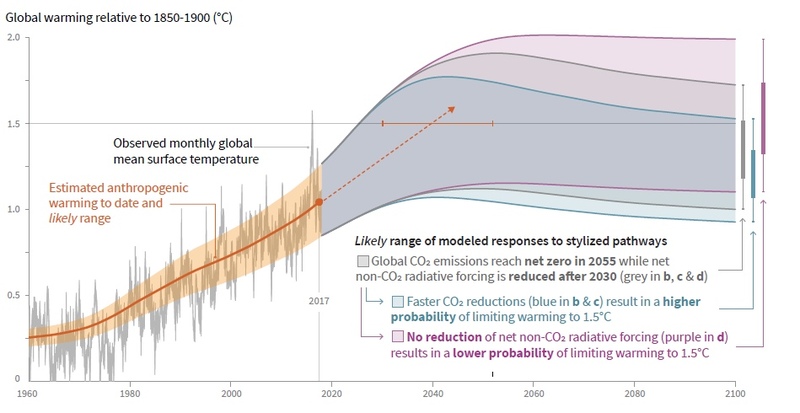 But while a model can be used to forecast, it is likely to fail at some level because other factors have not been considered. My best example of this is the Washtenaw County budget director’s model for revenue in the 2002-2004 timeframe. “The best predictor of the future is the past.” Since development (sprawl) was very rapid, the tax revenue for the County was increasing by 6% a year or more. He drew a straight-line curve showing a huge growth in funds over ten years. So the County forged ahead with several high-ticket projects in confidence that the funds would be available to pay the costs. He failed to anticipate either the many policy brakes (Greenbelt, etc.) governments put on sprawl or the massive economic collapse that began in Michigan as early as 2006. Currently, much policy in Ann Arbor is being driven by models, voiced or implied. For example, the model that if we continue to increase the housing supply, even with extremely high-priced luxury housing, the supply-demand ratio will mean that other housing in the area will become more affordable. This is stated as an immovable law of nature. But that can only be tested by putting a particular policy into place. The outcome will be fixed, whether it fulfills that prediction or not. So, often discussion of the emergent Ann Arbor is composed of warring models and thought experiments. A piece is missing, though. Have we as a populace and as a civic body really examined the critical questions of what that emergent Ann Arbor should be? We have not really elucidated our game board. How can we test proposed actions and initiatives against a desired outcome if we don’t even have a picture of the outcome? Do we really know what we want or what the future we are trying to achieve looks like? This leaves so many questions unanswered. We’ll try to consider them one at a time. 1.Where and what is Ann Arbor? This is significant because though all those addresses pay property tax to their local governments, many people and businesses in them identify themselves as “Ann Arbor” and have an interest in the future of that label. AAPS School District. The eastern border in Ypsilanti is Golfside Avenue. Of course, children who attend these schools have a common background because of that and it creates a sense of community. (Parents are engaged too.) Further, everyone in the district votes for the AAPS School Board and pays AAPS school taxes. These boundaries are identical for the Ann Arbor District Library. The library was historically part of the school district. The AADL split from the AAPS in 1996 and succeeded in persuading residents to vote in a perpetual millage (does not have to be renewed) of 2.0 mills. The AADL has won many awards and has multiple activities and several branches, including one in Pittsfield Township. It is an important community center. Portion of SE Michigan as shown in U.S. Census map of MSAs for the U.S.A. Note that Washtenaw County is “Ann Arbor”. The adjacent MSA, Detroit-Warren-Dearborn, defines the combined Detroit Metro. As we noted in an earlier post about regions including Ann Arbor, it was determined some years ago that the magic of the name, “Ann Arbor” could be used as a business and economic development asset for the entire county. Thus, Ann Arbor SPARK became “Ann Arbor, USA” and a marketing effort defined the entire county region as Ann Arbor. This designation has been solidified by the U.S. Census descriptor of our primary Census area (the Metropolitan Statistical Area, or MSA) as “Ann Arbor” – but its boundaries are those of Washtenaw County. Census information showing median income by MSA. Arrow is to Washtenaw County (Ann Arbor MSA). Note we are one of the 5 wealthiest counties in the Lower Peninsula. The actual Census was in 2010. It is supposed to be a comprehensive picture of the American population and includes much demographic and economic information. The basic Census uses a combination of paper forms and door-to-door interviews. The American Community Survey (ACS) continues to do spot surveys and produces updated information on many fronts, especially demographic and economic data. (Because it is not comprehensive, one needs to be cautious about drawing conclusions, since sampling error is always a possibility.) Graphic displays of this information can show a map of the U.S. in which various factors are called out by MSA. With just a little practice, one can quickly pick out Washtenaw County, right next to Wayne County in the far southeastern corner. This has led to much confusion because so many articles, especially those covering some national topic, use the Census MSA data for analysis. Data miners and analysts pick up all that nice easily accessible data and draw conclusions which show up in headlines that say “Ann Arbor is…” A good example was Richard Florida’s 2015 article on America’s Most Economically Segregated Cities. 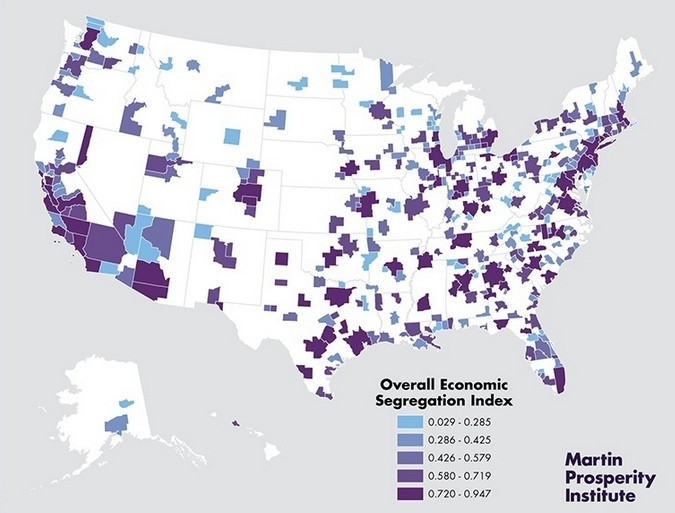 Headlines indicated that Ann Arbor was the 8th most economically segregated. Florida’s article was based on a longer study he did earlier, which in turn was based on a Pew Research Center study. The source of data for all? You guessed it – the Census. But while Florida referred often to “metros”, the title of his study was Segregated City. You’d have to forgive the casual reader for supposing that it meant Ann Arbor City. But if you examine the map closely, you’ll see that little Washtenaw County rectangle. Since this article was picked up by a number of mainstream media, the conflation and confusion was magnified. Washtenaw County median income by census tract. Dark green is highest income. This is more than confusing, it conveys the wrong information. 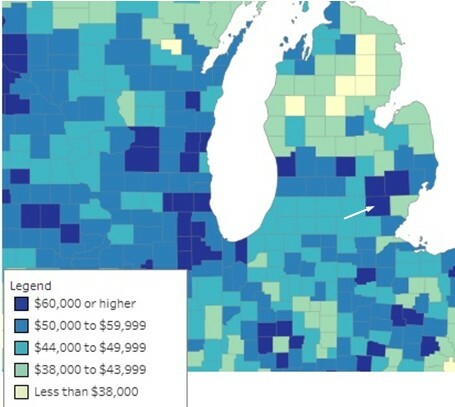 Washtenaw County is indeed an example of income segregation. 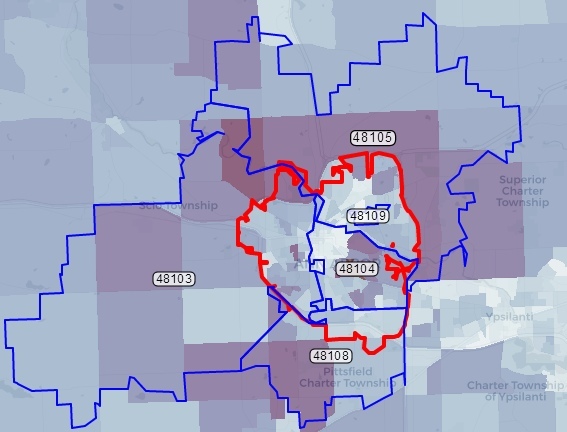 But Ann Arbor City actually contains a large number of the lower-income census tracts. The county includes some very well-heeled communities outside of Ann Arbor and Ypsilanti, such as Barton Village and several of the townships. It is necessary to go down to the level of individual census tracts to see that, and few studies do that. By now it has gotten so commonplace to see “Ann Arbor number one” stories that we could almost assume that we have somehow done everything perfectly. How can you argue with success? But that doesn’t necessarily jibe with the daily experience of many, or keep us from arguing about details. Ann Arbor author Patti S. Smith, writing in The Ann, analyzed a variety of the surveys and rating stories and made some good observations in her article, Ranking the Rankers: Just What do Those Top Ten Lists Mean? She offered a number of cautions, including that one should examine the methodology used by the ratings’ source. One of the recent ratings came from Niche.com – this one was pretty good. Ann Arbor is the best city in the U.S. to live in! Looking a little closer, it seems really good since we only scored Bs on housing, crime, jobs, and cost of living, and C on weather. They partly base their ranking on surveys and reviews. But also on many publicly available data bases. Yup, the Census Bureau was the first on the list. Where are we talking about? The take-home message? It is clear that Ann Arbor is both a city and a region. In another state it would probably be a larger city, perhaps with about the same geographic area as those zip codes, or even larger. We function much like a metropolitan area. But we don’t really have a command of that entire area, yet we are expected to serve it in many ways. It is important as we form an idea of where our future should lead us that we have a clear understanding of the Where that we mean. Sometimes real “granularity” is needed (getting down to the details, perhaps as small as specific neighborhoods or even just a few blocks). Sometimes it is about the greater metropolitan region or sometimes as broad as the County. Often when we are talking about the urban area, the City of Ypsilanti becomes important to our discussion because we have so many dependencies on one another. But policy discussions about future initiatives should be informed by an acute awareness of which Ann Arbor we are assigning characteristics or responsibility to. Too often, our leaders make sweeping statements about what Ann Arbor is or should be. For those of us especially who live in the City of Ann Arbor, we need to know where they are. NOTE: For information from the U.S. Census about Washtenaw County, consult this page.